We have already been packing for weeks. The majority of our furniture has been sold on Craigslist. Last Saturday we held a “moving sale” where we unloaded a cache of stuff that we should have purged years ago. Our kids’ rooms are empty. There is a POD in our front yard. We’ve loaded into it about fifteen boxes, a couple of pieces of furniture, and had movers put our piano inside, awaiting the long trip to Florida. We’ve done a great deal on our own. But we are more than indebted to some very special people who have helped us thus far: pricing items for the moving sale; making trips from church with a car full of tables; doing needed repairs in our home; sitting with us through the day of the sale; offering to help in any imaginable way. We are unworthy servants. We deserve none of the love we have been shown in the form of selfless help, but we have received it. It is a true form of grace: undeserved. We are leaving the people we have served for the past 15 years, and yet they still want to help and serve us. Incredible. I can’t quite wrap my mind around it or fathom it. Which is proof to me that it’s true grace. 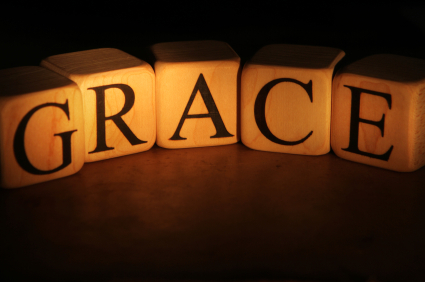 There is no way to humanly understand grace. It comes unexpectedly and undeserved. It comes when one feels most unworthy. It comes whether we want it to or not. It comes in the form of love wrapped in service. It comes without expecting anything in return. I don’t know about you, but that’s not the way my mind operates. I want to give something in return, but the answer I get is “no.” Unfathomable. I don’t deserve it. But that’s grace. Undeserved. Unearned. Unbelievable. We have to be out of our house in a week-and-a-half. By God’s grace (and I write that with no hyperbole), we will have the rest packed, disposed of, or given away in the nick of time. This house has been a “grace place.” We’ve seen God work in ways too numerous to mention. Even in our final days domiciled here, God is demonstrating His grace to us in concrete ways. Now let’s see how grace is given and shown as we try to fit all that we still own into a 16 foot POD. Where have you seen God’s grace given through the love and service of others?